When it comes to adding nutrients to your garden soil, or coddling particular plants with special needs, there are many organic options. Cultural practices such as cover cropping, crop rotation, and composting will ensure balanced nutrition of your soil in the long run, and organic amendments along the way will help your garden thrive. Here are some tips and products for success. Before feeding your garden, always observe your plants. In fertile soil, plants may not require additional fertilizer. Do plants look lame, or require multiple smaller doses of fertilizer? (Onions like this treatment). Do your plants have poor color? Poor vigor? Side Dressing—distributing granular organic fertilizer at the base of the plants, near the stems. (Allows for slow release and plant intake of nutrients). Learn which plants are heavy-feeders, and which ones are not. Heavy-feeders are plants that require a lot of mineral nutrients to thrive. Examples include tomatoes, cabbage, broccoli, sunflowers, and onions. Light-feeders are plants that either require very small amounts of mineral nutrients, or they themselves create nutrients. Examples include beans, peas, and lettuce. Always use cultural methods for building soil structure and nutrition, such as crop rotation, (which can allow you to alternate heavy and light feeding crops), cover cropping with both legume (nitrogen-fixing) and grain (for organic matter) species, mulching, and composting. Test your soil annually to learn what macronutrients your soil needs. 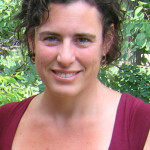 For a closer look at soil testing, check out Ask Ruth from November 2010. Remember, don’t waste fertilizer and time on plants that are past their prime. The best time to feed is when plants are young, or just about to set flowers and fruit. For perennial plants, there will be a recommended schedule for pruning and fertilizing in favor of optimum growth. Compost and vermicompost add physical soil stuff to your garden, so consider how they affect soil. Organic matter contributes to greater acidity overtime, so while compost is balanced for garden use, you’ll want to make sure that as you’re growing your soil to promote organic matter, you’ll want to continually test the soil pH to ensure it promotes plant growth. To read more about azomite and zeolite, check out Ask Ruth from July 2012. I am from SA. Can you please assist me in making my own fertilizer using alfalfa, bonemeal, calsium, kelp and bonemeal. What are the ratios? 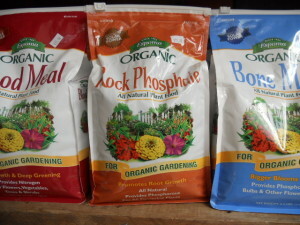 I want fertilizer for blooming plants, vegetables, fruit trees , roses ect. Patryk Battle of Living Web Farms (http://livingwebfarms.org/) has answered this question. He is a mentor, teacher, and dear friend of Organic Growers School. I have on occasion mixed fertilizers with compost to use for top dressing. For reasons that my response should explain I don’t really do this anymore. We regularly add small amounts of minerals including Azomite (usually less than 5% of the total mix) and rock dust (up to 33%) ideally paramagnetic to a 50-50 bio-char compost mix. To this we add approximately 2% to 15% organic alfalfa meal (note in the last two years or so the max alfalfa meal is much closer to 5%) depending upon the application. We mix this into the soil in our planting holes or work it into areas we will be seeding into at the very light rate so that the salts in the compost and Azomite do not inhibit germination. But we have never been particularly moved to “fertilize” with the exception of adding below normal rate amounts of Fish Hydrolysate and Maxicrop Seaweed to compost tea. We put this out as foliar application. We still do this some, but the truth is we are more inspired to work on maximizing the microbial health of our soils through the extensive use of multi-species cover crops, low till practices and by ensuring we have adequate minerals in our soil. If we are confident that these aspects are where we want them to be we prefer to let plants get the nutrients via their relationship with the life in healthy soil. This helps us to avoid creating imbalances. The more we learn the more leery we are of fertilizer formulas. At the very least they should only be applied after taking a soil test and adjusting the fertilizer mix to the results of the soil test. Dan does a great job of explaining what’s pertinent in soil tests and how to interpret and apply the results of Albrecht type soil tests (he explains what this means in the video and names some of the companies that provide these kinds of tests). In part because our format allows him to spend lots of time on what normally just gets touched upon in the typical hour and 1/2 presentation he makes it likely that when you’re done watching this you will be able to come up with specific application rates for a given of area garden for all of the key minerals. I say this with the caveat however of admitting that I need to go back and more carefully watch that video to see if Dan was paying attention to the fact that the application of phosphorus based fertilizers can inhibit the activity of mycorrhiza. These symbiotic fungi can actually mobilize plant unavailable, and therefore not reported on soil tests, phosphorus. This is key because phosphorus fertilizer is already past the point of peak availability and is very likely to become the major kink in our food production systems. So I encourage folks to be very circumspect in the use of phosphorus fertilizers. Hopefully they will check this out for themselves on the video and research more into how to help plants to access the phosphorus that is in the soil but not available to plants except through microbial activity. They can also explore the use of plants such as buckwheat which do have some capacity to access this normally plant unavailable phosphorus. It is also true that the over application of nitrogen fertilizer will cause legumes and other nitrogen fixing plants to bypass their symbiotic relationships with bacteria which enables them to access the huge amounts of available nitrogen in our atmosphere. This really matters since invariably nitrogen fertilizers at least somewhat if not majorly can affect our groundwater. So not the straight forward answer likely hoped for. Sorry! But both the joy and the and the burden of being an organic grower is the need to pay attention to the complexity and interrelationship of all aspects of our fertility systems in order to ensure that plants are thriving via the systems they have evolved with.